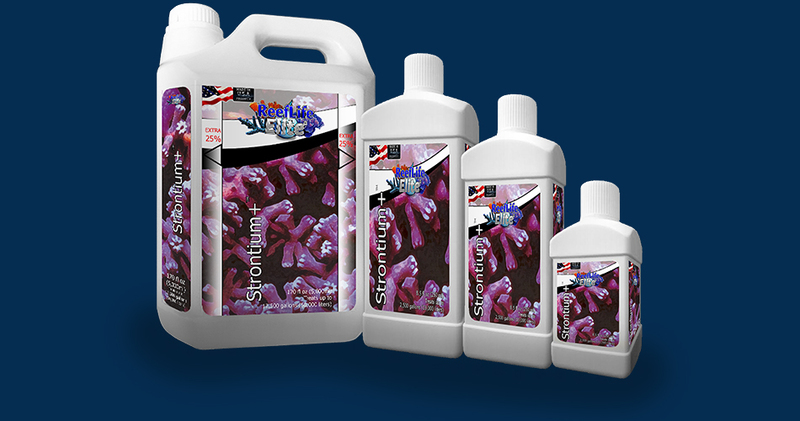 ReefLifeEliteR Strontium+TM is important for accelerating coral and calcareous algae growth. Natural sea water contains approx 7-9 ppm. strontium. This strontium is associated (”chelated”) with sulphate. Since the growth of corals and calcareous algae goes hand in hand with strontium and calcium depletion, depletion of calcium (which is very easily measurable) usually means depletion of strontium as well. ReefLifeEliteR Strontium+TM should be added to all marine aquariums on a regular basis as most corals absorb strontium faster than other elements during their normal metabolic process. Corals will open more and stay attached to thair skeletons better, with regular use. 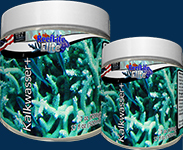 For best results use ReefLifeEliteR CalciumLTM or ReefLifeEliteR CalciumPTM or ReefLifeEliteR Kalkwasser+TM or ReefLifeEliteR Ion+ ATM and ReefLifeEliteR Ion- BTM first. Use of ReefLifeEliteR PerfectTM and ReefLifeEliteR ReefVitsTM are beneficial, as well. Add 20 ml (1 capful) per 200 gallons (800 liters) once a week. Deionized water, Strontium 45% , Molybdenum 10% and Other.